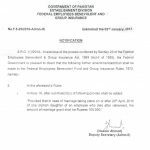 Establish Division Federal Employees Benevolent & Group Insurance Funds has made amendment in Federal Employees Benevolent Fund & Group Insurance Rules-1972 vide Notification No. 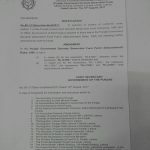 18-22/Act-Amdt/Plan 2002 dated 23rd November 2012. 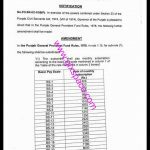 The new rates will be admissible wef 01-09-2012. The minimum rates of monthly Benevolent Grant has been raised to Rs.4000/- with the maximum of Rs.10,100/- PM as per the column 5 of Sixth Schedule. 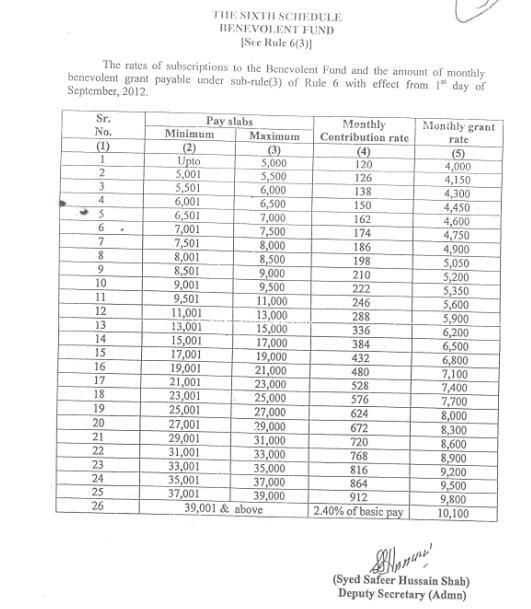 In the same way the rates of monthly subscription of Benevolent Fund have also been increased from 2% to 2.40% of the basic pay without maximum limit as per column 4 of Sixth Schedule. The monthly Benevolent Grant of the beneficiaries who are in receipt of monthly grant on 31-08-2012 has been increased by 40% of grant wef 01-09-2012. 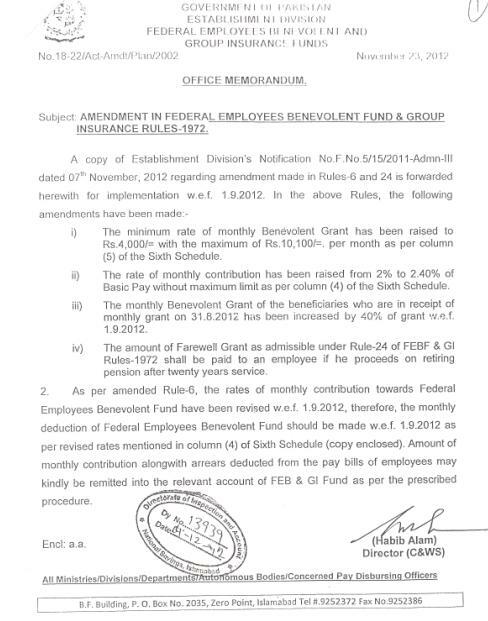 The amount of Farewell Grant as admissible under the rule-24 of FEBF & GI Rules-1972 will be paid to an employee if he proceeds on retiring pension after 25 years service. mery abu ki 2010 me duran e service deth ho gai.meri Ammi pehly hi Intqal kr chuki hai.me ne Guardian k teht benevolent fund k liye aplly kiya to Dco Chiniot k B.F branch k clerk ne jo rate bnaya wo ghalt tha.un k mutabiq meri behn ki total age 15 saal tk count krey ge,wo date of deth se 5 month k 8500/- Rs diye gye.me choti Behn ki umr 25 saal hai. Govt benevolent fund Punjab ki Policy k mutabiq meri behn date of deth se 15 saal k period tk ya shadi ho jany k tk monthly grant ki haqdar hai.ap ki oppinion kya hai ya Urdu me Govt benevolent fund ki policy kahan se mily gi? Benevolent fund kaise calculate karte plz btadin jis kisi ko hi sahi pta hoo. I need Group Insurance rates of Govt. of Punjab for in-service died employee. Send me on argurmani@gmail.com please. It is mentioned that I have been serving in Karachi, Lahore and Islamabad since 1990 in Federal Government. Now a days I am teaching in QAU, Islamabad. 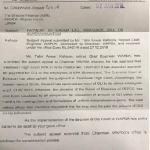 I want to collect my GP Fund in Islamabad AGPR, Please tell me how can I request Karachi and Lahore AGPR to send my amount in Islamabad AGPR. I will appreciate your reply Please. Dear Dr. Muhammad Ilyas, You should apply to ur 1st Department to request to the concerned account office to transfer the GP Fund Amount to the next Account Office and then they will transfer the same to ur present department. It is my opinion for further details plz contact to ur 1st department. I as an employee of Govt. 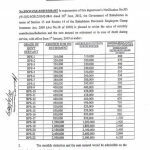 of Sindh request you that please provide the last updated rates of Group Insurance rates which are being deducted by the Govt. of Sindh and what insurance coverage is providing against these rates to every employees. Dear Ather Qadri meray pas is ki copy nahin hay. salute for doing common good for all govt employees. your services are appreciable across the border. 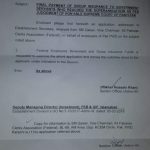 plz do reply that what happened to my old query of m.Phil allowance notification for sindh govt,your placed m.phil allowance for Punjab province is on instruction/follow up of federal govt or province govt s own discretion power to grant m.phil allowance. kindly reply. 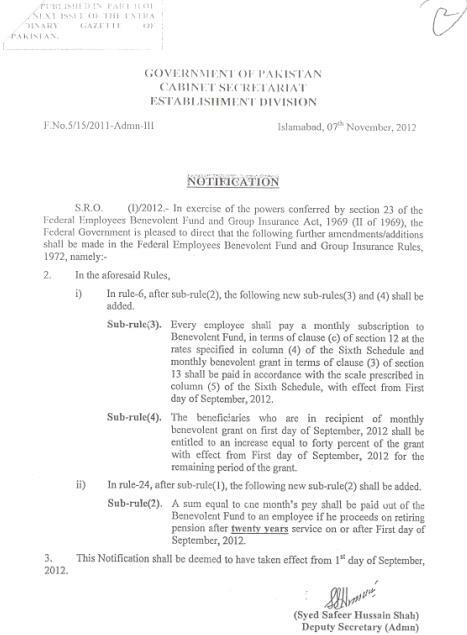 secondly if someone draws basic pay rs 41000 ,then its b.f deduction is 615.on what formula? aoa hope u r doing well.kindly tell me is there some difference between benvolant fund n group insurance? n what kind of difference? n also tell me that who is admissible to take group insurance?